Mobile App Marketing Blogs List. The Best Mobile App Marketing blogs from thousands of Mobile and Marketing blogs in our index using search and social metrics. We’ve carefully selected these websites because they are actively working to educate, inspire, and empower their readers with frequent updates and high-quality information. Graz, Österreich About Blog App Radar is an all-in-one ASO tool to help you unleash the full potential of your mobile apps and games. It was developed by the Austrian-based startup appers gmbh. Follow App Radar blog to learn more about hot app marketing trends and news. Facebook fans 49,558. Twitter followers 2,219. Bay Area About Blog I am Steve P. Young not to be confused with the other Steve Young who played for the San Francisco 49’ers. Follow his blog to get the best growth hacks in the app marketing space. You will discover strategies for app store optimization, PR and App Store features. Facebook fans 3,691. Twitter followers 1,900. Facebook fans 2,174. Twitter followers 1,728. San Jose, California About Blog I created this blog to share with other mobile app developers/marketers, my experience marketing my own apps on the different app stores. I’m not an app marketing guru but I digest everything I can on the subject through other blogs and podcasts. More importantly, I test what I learn with my own apps. That’s why this blog is really a laboratory or “Lab” where I try things out and share with you what worked and what didn’t. Facebook fans n/a. Twitter followers 1,053. About Blog Welcome to the Apptamin App Marketing Blog!The idea of this blog is not to focus on our services (that’s what our website is for) but to discuss and share resources about mobile apps promotions, tips, must-dos, good practices, experience sharing, etc. This blog is for mobile apps developers or even retailers that want to learn more about how to promote their apps. Marketing and promoting your app never stops, and could actually take almost as many full-time jobs as you’d want. Facebook fans 1,410. Twitter followers 5,094. London About Blog Yodel Mobile is a full-service global mobile marketing agency and a top app marketing agency, helping businesses achieve app marketing success. Subscribe their blog for the latest mobile and app marketing trends and news. Facebook fans 149. Twitter followers 4,241. Belfast About Blog Hurree is the marketing automation platform for apps that allows you to predict, prompt and profile users in a way so personalised they can't help but engage. Follow their app marketing blog posts to improve your relationship with your users to keep them coming back. Facebook fans 115. Twitter followers 677. Palo Alto, CA About Blog Liftoff is the leading mobile app optimization marketing and retargeting platform for running true CPA optimized mobile app install campaigns to get new, quality users. Keep up with all the Latest updates, Trends and Best Practices in mobile app marketing, mobile app advertising and Mobile user acquisition. Facebook fans 4,284. Twitter followers 1,738. San Francisco, CA About Blog App Samurai is a self-service mobile advertising tool for high-growth companies. Mobile ad planning, execution and analysis are complicated for high-growth companies because they cannot reach all available app marketing tools. App Samurai makes it easy for them without requiring in-depth mobile advertising knowledge! Facebook fans 17,692. Twitter followers 2,542. Berlin, Germany About Blog Our modular app system allows to create a separate app. We assist in mobile marketing as well as in evaluation and optimization of its benefits and pay special attention to action- and dialogue-based apps. News from the mobile marketing world. Subsribe the App Yourself Blog to Stay informed about new features, products and hints. Facebook fans 12,184. Twitter followers 1,625. United States, Israel About Blog Bidalgo is the leading provider of ad automation solutions to help app marketers achieve unparalleled growth quickly, easily and profitably. Follow Bidalgo's blog for performance marketing campaigns on Facebook, Google & more. Get expert advice on how to supercharge your app marketing campaigns. Facebook fans 4,418. Twitter followers 602. San Jose, CA About Blog Gummicube is revolutionizing the way businesses connect with and understand their mobile audience. Keep up with the latest information and news on Mobile App Marketing. Facebook fans 223. Twitter followers 1,193. India | USA About Blog 360 Degree Technosoft has a 360 Degree approach to find the solutions of any problems faced by our client. We always try to mitigate software problems to the maximum. Facebook fans 1,967. Twitter followers 1,698. Amsterdam, North Holland About Blog Appromoters is an app marketing agency and mobile ad network. We help app developers promote and monetize their apps with unique ad thinking and technology. Join our app marketing blog and learn everything you need about mobile marketing, social media marketing, mobile advertising and App Store Optimization. Facebook fans 962. Twitter followers 502. Toronto and New York About Blog App Promo offers Strategy, Marketing and Monetization services across iOS, and Android. ASO (App Store Optimization) and App Preview Videos available for all AppStores. Facebook fans 8,290. Twitter followers 2,671. India About Blog Moveo Apps is a mobile app design & development company creating definitive mobile experiences for iOS and Android. Facebook fans 154. Twitter followers 2,015. About Blog MobileFirms is the right place to find mobile app marketing companies worldwide. From advertising, testing to analytics, the best firms are listed in our directory. Get your mobile app to the #1 on the app stores with the marketing services you will find in MobileFirms. Facebook fans 522. Twitter followers 130. London/Bangkok About Blog Appsynth is a full-service mobile agency providing data-driven solutions for sustainable mobile growth. This app marketing blog teaches you how to increase app installs, improve user engagement and how to monetize your app. Facebook fans 926. Twitter followers 1,988. Austin, TX. About Blog Appspire Me is a premier marketing service designed to get mobile applications the maximum downloads possible. With our experience, tools, staff, and creative ingenuity, we have the ability to take a single mobile app from zero downloads per day to thousands. Facebook fans 555. Twitter followers 587. Facebook fans 30. Twitter followers 98. San Francisco About Blog Mobile Action gives you access to world-class app store data that will help you compete in today’s crowded marketplace. Are you struggling with marketing your mobile app? Browse our list of comprehensive resources to catapult your app above the competition. Facebook fans 3,483. Twitter followers 4,940. Nottingham, England About Blog AppInstitute is at the forefront of the mobile app platform industry. Our cloud-based service aims to revolutionise the app market by providing a SaaS (Software as a Service) platform that allows businesses and individuals with little to no prior technical knowledge to create their own app. Facebook fans 4,725. Twitter followers 2,952. Seattle, WA About Blog Apptentive’s Mobile Customer Experience software empowers companies to build brands customers love by understanding their behavior and expectations. Keep up with the Being Apptentive Blog for Connecting and educating mobile enthusiasts from around the globe. Facebook fans 2,117. Twitter followers 8,971. 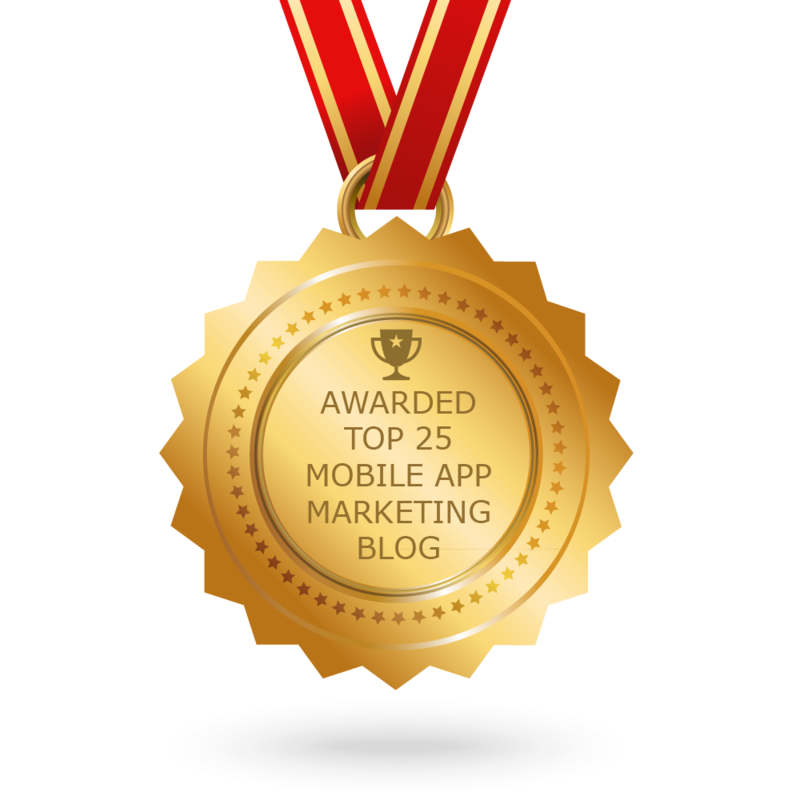 CONGRATULATIONS to every blogger that has made this Top Mobile App Marketing Blogs list! This is the most comprehensive list of best Mobile App Marketing blogs on the internet and I’m honoured to have you as part of this! I personally give you a high-five and want to thank you for your contribution to this world.